Fillers and Facelifts: Are There Limits? We see a few patients who arrive at the office with the preconceived notion that they need a facelift but really some filler like Bellafill and proper medical grade skincare along with minimally invasive tightening and smoothing treatments like micro needling is really all they need. Conversely, we see some patients who come in thinking they will look great with some fillers and a little Botox but what really need is a facelift or a neck lift. Often, these same patients are confused about the type of lift they need. See my article of neck lift and facelift terminology confusion. Skin wrinkle fillers are becoming more and more popular for facial rejuvenation, but there are limits to what these products can do. Depending on the patient’s age and the type and severity of their wrinkles and folds, a facelift may be a better alternative. Facelift and Bellafill permanent filler for lower eyelids and lips. This individual needs much more than fillers to get a reasonable rejuvenation. What types of fillers are used for facial rejuvenation? Botox and other muscle relaxers called neurotoxins like Dysport or Xeomen relax overactive facial muscles that produce crow’s feet and brow furrows. While Botox, Dysport and Xeomen are used around the mouth and below eyes, these agents are best for Crow’s feet at the side of the eyes and forehead wrinkles like the glabellar frown lines or number eleven (#11’s). Fillers such as Bellafill, Restylane, Juvederm and Belotero address surface depressions. These include laugh lines, also known as nasolabial folds, and marionette lines, which are the folds that deepen between the corners of the mouth down to the jaw line. Fillers like Bellafill can also be used to fill in hollow temples, augment cheeks and to correct lower eyelid bags without surgery. However, fillers are not very effective for finely etched-in lines or wrinkles in the cheeks. They can help the lines of the upper lip. When used appropriately, both the fillers, like Bellafill, and the neurotoxins, like Botox, can help stave off the need for facial surgery or enhance the results of surgery. Fillers are most effective in individuals who are younger than fifty and who do not have sufficient looseness of the cheeks and neck to warrant a facelift. 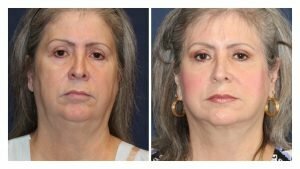 However, in older patients with significant jowl formation and loose neck skin with vertical bands, surgery such as a facelift is a more effective and long-lasting treatment (Figure 1). 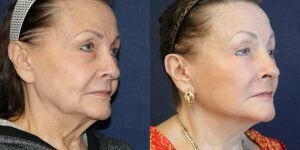 What are the limitations of fillers? Misguided efforts to avoid surgery by overusing fillers can result in an unnatural appearance. The “botched” filler or frozen Botox look. The concept of adding enough volume to take up loose skin, instead of surgically tightening it, is popular today among non-surgeons. Unfortunately, it is a mistaken notion that fillers can effectively address tissue laxity and produce a result like surgery. Patients compound this problem out of an instinct to avoid surgery if possible. Misuse of fillers can result in bloated cheeks that lack normal definition, impaired facial expression due to tissue stiffness, and unaesthetic, distorted facial proportions. For those patients who believe that fillers and Botox are a cheaper alternative to a facelift, these less invasive procedures can become a much costlier option than surgery, as the expense of these repeated treatments accumulates. Fillers require ongoing maintenance with risks of bruising and infection each time. Permanent fillers like Bellafill can avoid much of this disadvantage, but permanent fillers like Bellafill that are not perfectly placed can result in permanent aesthetic problems too. Therefore, if you are considering a filler like Bellafill make sure that you go to a very experienced Bellafill injector. The role of surgery is to restore sagging tissue to a more youthful position that cannot be improved with more conservative less invasive procedures. Full facelifts tighten the neck, the lower cheeks and remove jowls and improve the upper cheek face area. The elevated tissues also fill in cheek hollows to some degree. Facelifts can also tighten loose neck skin and eliminate vertical bands, something that no filler or Botox injection can accomplish. Often in older individuals who have lost facial volume with aging in areas like the lips and cheeks can have volume restored a filler like Bellafill. Like fillers, surgery also has boundaries. Over-tightening is not the solution for lost tissue volume. Instead, fillers or fat grafts are required to restore a youthful fullness and smooth contours. 6 months After Bellafill for Under Eyes and Around Mouth to restore volume and a plus Neck Lift/Lower Facelift to improve her saggy neck,jowls and jaw line. American and Canadian board certified plastic surgeon Dr. Brian Windle is available to answer any questions you might have about facelift surgery, either on its own or combined with another procedure. To learn more about the benefits of the procedure schedule a consultation today.